GolfBC introduced The Okanagan Golf Club to Kelowna in 1999, a spectacular complement to Kelowna's premiere golf product. Exceptional by design, The Okanagan Golf Club boasts 36 holes of spectacular championship golf; The Quail Course and Golden Bear Designed - The Bear Course, a spacious clubhouse facility, double-ended practice facility and convenient location near the Kelowna International Airport. The Okanagan Golf Club experience is defined by a combination of exceptional golf courses, beautiful surroundings, world-class amenities and a commitment to quality service. The Okanagan Golf Club Management thanks you for your interest in our facility and welcomes the opportunity to provide you with a tour and any further information that you may require. Best Member Course in the Okanagan Valley! Spectacular conditions. Double ended Practice Facility with Practice Greens, Practice Bunkers and Teaching Academy with CPGA Instructors. Clubhouse and Lounge offering Breakfast, Lunch, Dinner and Theme Nights. Plenty of Member Events. This and much more ADDS UP to the Okanagan Valley’s Best Membership offer! BONUS - Purchase before March and receive a $100/$150 Food & Beverage Credit*!! Unlimited playing privileges on The Bear Course Monday thru Thursday. 7 day advance booking privilege. Reduced power cart fees and complimentary pull cart usage. Reduced rate on The Quail Course Monday thru Thursday. Reduced rate on The Quail Course and Bear Course Friday, Saturday, Sunday & Holidays. 25 or 50 transferable corporate green fee vouchers. Vouchers are redeemable 7 days per week throughout the golf season on either The Quail Course or The Bear Course. Unlimited playing privileges on The Quail Course and The Bear Course. 5 day advance booking privilege. 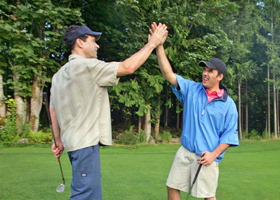 Invitation to participate in club social events, special days and tournaments. Intermediate Annual Members shall have no further right to participate in the intermediate membership program subsequent to his/her 30th Birthday. Playing privileges on The Quail Course and The Bear Course. Juniors will be permitted to book tee times one day in advance. Restricted to playing after 1:00 pm weekends and holidays. Reduced fee for your guests. Invitation to participate in pre-organized junior programs and instruction clinics. Computerized BCGA handicap system (optional with Corporate Membership). 20% discount on Golf Shop apparel & accessories, excluding sale merchandise. 10% discount on regular priced menu items in Sarazen's Restaurant. Note - All prices are subject to applicable taxes. Additional $80 Club Fees apply to all memberships. All members have first right of refusal for 2020. *Food & Beverage credits only available for memberships purchased prior to March 1, 2019.